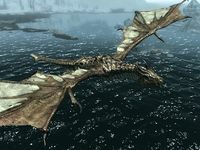 Dragons (drah-gkon and dov-rha to the ancient Nords, or dov in their native language) are large flying reptilian creatures that are encountered in Skyrim. They are immortal and highly intelligent, have an affinity for magic, and were once even worshipped by the ancient Nordic people. Temples dedicated to dragon worship were built across the province of Skyrim, but now only a few artifacts relating to the Dragon Cult remain, such as dragon claws and Dragon Priest Masks. 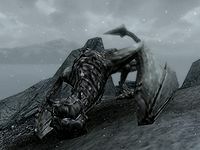 Once thought long dead, dragons are now beginning to return and are a major part of Skyrim's main quest. 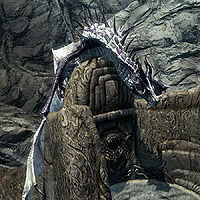 There are several encounters with dragons during the main questline, though randomly generated dragons also appear in the wild after the completion of Dragon Rising. Although the majority of dragon encounters will involve only a single creature, in rare cases it is possible to come across two or more of them at a time, especially after fast-traveling. All dragon lairs contain word walls and are indicated by a dragon's head icon on the map. Dragons are also often encountered soon after fast-traveling to a relatively wide open location, within smaller towns like Riverwood and Rorikstead, or even inside large walled cities like Whiterun and Markarth. Dragons are fearsome opponents in combat and are some of the most dangerous creatures in all of Tamriel. As your level increases, more difficult types of dragons will appear, ranging from a basic dragon at the lowest levels up to a mighty legendary dragon at the highest. Encounters with dragons in the wild are heralded by a loud roar; the dragon will often fly very close to you if it has spotted you, causing a palpable rush of air, almost as if the dragon is deliberately trying to provoke you. Not all dragons are automatically hostile to you, however. Some will simply circle overhead for a while without engaging in combat; if you ignore it long enough, the event will end and the dragon will fly off. Dragons are highly intelligent and can use the power of the Thu'um (also known as "The Voice" or Dragon Shouts) to attack their enemies, using short phrases of words of power to cause a variety of effects. It is said that combat with dragons is actually a debate; as the dragon Paarthurnax explains, "There is no distinction between debate and combat to a dragon. Tinvaak los grah. For us it is one and the same." All dragons have either frost- or fire-based breath attacks and will use them while airborne and while on the ground. The damage inflicted by this attack can be decreased with the appropriate elemental resistance, magic resistance, and wards. During combat, dragons will occasionally land on the ground to briefly engage in melee with you or any NPCs or other creatures in the area before taking flight again. Dragons may also perch on rooftops or other features, such as word walls, attacking creatures below them while keeping out of reach of melee attacks. The Dragonrend shout can be used to force a flying dragon to land for a short time. Once a dragon is at about half of its health, it will either land on the ground (often with a clumsy crash) and not take flight for the rest of the battle or, rarely, flee combat altogether, depriving you of a dragon soul to absorb. A Blood Dragon attacks with its Fire Breath. While a dragon's breath is a formidable attack in its own right, dragons also have a devastatingly powerful bite. It is important to keep your health high when close to a dragon on the ground. If your health drops below a certain threshold and you are close to the dragon's head, the dragon may kill you with an action sequence: it will lunge forward and grip you in its jaws, lift you in the air, swing you from side to side, and then throw your corpse to the ground. Staying to one side of the dragon while it is on the ground can help keep you clear of its bite and breath, but the dragon will still be able to lash at you with its wings or tail. You can try using trees and other landscape features to gain a cover advantage, but the game may not register all forms of cover and the dragon may still be able to attack through them, so choose your hiding places carefully. Dragons will attack nearby creatures of any kind, from mudcrabs to giants, but not other dragons. You can use this to your advantage by engaging a dragon where other creatures are nearby, especially if the dragon has already selected alternate prey, using the distraction as an opportunity to move in for the attack. Dragons will even target other creatures while engaging you in combat, so fighting alongside followers and other NPCs or creatures makes surviving a dragon assault much more feasible, since damage can be absorbed by others. However, the presence of other creatures does not guarantee the dragon will attack them instead of you, even if it was already fighting them when you arrived. When you slay a dragon in combat, the body of the beast will be engulfed in flames, and you will absorb its soul. After the flames subside, you will be left with the dragon's bare skeleton, which can then be looted for its bones, scales and other miscellaneous treasure. The scales and bones can then be used to make formidable armor. If the Dawnguard add-on is installed, the dragon's bones can also be used to create and temper Dragonbone weapons. Dragon souls can be saved and used to unlock Dragon Shouts and, with the completion of the Dragonborn questline, reset skill perks. Dragons have long, slender extremities covered in scales, and large, thin, leathery wings. Their feet are tipped with three sharp talons and one vestigial digit known as a dewclaw, a characteristic that can be seen in their written language. Dragons have horns and spiked ridges along their backs and are several times larger than any human or elf. They have two hind legs but no forearms, so they use their wings to crawl when they are forced to traverse along the ground. With the exception of a few unique dragons, there are several varieties of dragons that can generally be distinguished by their color. The table below lists the dragon colors found in the game. In addition to the special abilities listed below, all dragons have a special Dragonskin perk, which negates 50% of all damage from any attacker except the Dragonborn. Except for basic Dragons and the Skeletal Dragon, all dragons also have an ability called "Dragon Bite", which grants them a constant Fortify Unarmed Damage effect. Dragons are immune to paralysis and cannot be soul trapped. 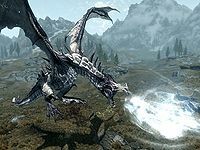 Dragons have their own unique "dragon" versions of the Fire Breath, Frost Breath, Unrelenting Force, and Drain VitalityDG shouts, and their Fireball and Ice Storm spells are treated like shouts as well. Dragons rely on their magicka reserves to use these shouts, which means that if a dragon's magicka is drained, it will not be able to use its shouts. The base damage for all the dragons detailed below is 25 (with the exception of the Skeletal Dragon), and their tail swipe attacks will stagger all enemies in a large area. The sections below detail the attributes and abilities of each of the various types of dragons. The types of dragons that spawn in the wild will depend on your level, but regardless of your level, dragons' combat abilities and their centrality to the game's plot effectively make them game bosses. Note that although the different varieties of dragon normally start to appear at the player level indicated, it is possible, though rare, to encounter a more powerful dragon at a much lower level. Basic Dragons are considered to be the easiest dragon type to fight, although they can provide a challenge early in the game. They come in three different colors and can have either fire- or frost-based attacks. They will spawn at any level once the quest Dragon Rising has been completed. All Blood Dragons are entirely green in color, can breathe either fire or frost, and are slightly tougher than basic dragons. These dragons have sail-like fins on their backs and on either side of their tails, and a bony ridge along their foreheads. Blood Dragons begin to appear in leveled lists at level 18. The Skeletal Dragon is a unique dragon found only in Labyrinthian that is made up entirely of bone, with no scales or flesh, and cannot fly. It breathes frost, but has no resistance to frost or weakness to fire; instead, it has weakness to magic (100 pts). The Skeletal Dragon has no soul to absorb and, unlike living dragons, drops only dragon bones when killed. The Skeletal Dragon's base damage is 50, and its bite attack multiplies this damage by 2 instead of 1.5. The Skeletal Dragon breathes a blast of frost. Frost Dragons are colored white and grey and have very large, black spikes along their back. They have a frost-based breath attack. These dragons are a little tougher than Blood dragons and have significantly more health. Frost Dragons begin to appear in leveled lists at level 27. All Elder Dragons are bronze in color and are significantly tougher than the previous types, both in melee and breath attacks. Their wings have a unique two-tone pattern, with bronze at the top and a lighter green lower down. They can breathe either fire or frost, and begin appearing in leveled lists at level 36. An Elder Dragon glides over the water. Ancient Dragons are covered with coppery red-and-black scales, with almost no ridges or spikes on their backs, and are capable of breathing either fire or frost. The Ancient Dragon's "Dragon Bite" adds a massive 175 points of damage to their attacks, making them remarkably deadly both in the air and on the ground. 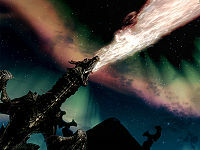 Until Dawnguard was released, they were the strongest non-unique dragons encountered in the game. Ancient Dragons begin to appear in leveled lists at level 45. An Ancient Dragon scorches the air with its Fire Breath. 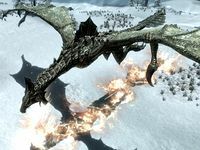 Serpentine Dragons are found only on Solstheim and can breathe frost or fire. Their appearance is unique compared to other dragons, most notably their blue hue, lack of scutes, and oversized bottom jaws which give them a distinctive underbite. They are formidable foes, possessing slightly greater strength than an Ancient Dragon. There is one named Serpentine Dragon, Sahrotaar, whom Miraak uses as his mount. Serpentine Dragons begin to appear in leveled lists at level 55 if Dragonborn is installed. Revered Dragons are orange-scaled dragons that have long, flat bodies and broad tails. In addition to their Fire Breath, they can use a dragon version of the Drain Vitality shout, which lets them rapidly drain a victim's health, magicka, and stamina. Revered Dragons begin to appear in leveled lists at level 59 if Dawnguard is installed. 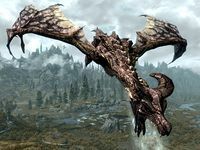 Second only to Alduin in their sheer power, Legendary Dragons have striped black and purple scales, large curved horns, unusually long claws on their white-and-purple wings, and what appear to be compound eyes. Like the Revered Dragons, they can use Drain Vitality as well as the traditional Fire or Frost Breath. 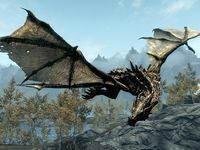 Legendary Dragons begin to appear in leveled lists at level 78 if Dawnguard is installed. A Legendary Dragon swoops down with a frosty blast. "Destroyer Devour Master" The firstborn of Akatosh, elder brother of Paarthurnax, and self-proclaimed aspect of Akatosh. Also known as "The World-Eater" and "Bane of Kings". "Curse Never Dying" An undead dragon the Ideal Masters tricked into guarding the Soul Cairn for eternity. He can be summoned after defeating him and learning his shout. "Sorcerer Day Mind" Found outside of Nchardak on the island of Solstheim. "Ancient Dominate" In the Black Book: Waking Dreams, encountered during the quest At the Summit of Apocrypha. "Allegiance Strong Hunt" The first living dragon you will fight in Skyrim, at the Western Watchtower near Whiterun. There had been no previous record of his death, and he may have actually survived in hiding all this time until Alduin's return. NaaslaarumDG N1SL1RUM One of two dragons encountered in a frozen lake in the Forgotten Vale. They are fought simultaneously and can dive under the frozen lake to ambush you. "Fury Burn Wither" Buried in a mound west of Rorikstead. "Snow Hunter Wing" Was the right-hand to Alduin, records date by interrogation of captured Dragon Cultists during Crusade. Buried in a mound in the south east of Skyrim, near Riften. After completing the main quest, Odahviing can be summoned by using a dragon shout called "Call Dragon". "Ambition Overlord Cruelty" The legendary lieutenant of Alduin in The Dragon War. He is now known to reside on the Throat of the World under the protection of the Greybeards of High Hrothgar. "Dominate Wise ?" In the Black Book: Waking Dreams, encountered during the quest At the Summit of Apocrypha. "Phantom Sky Hunt" Buried near Kynesgrove, encountered during A Blade in the Dark. "Mighty Servant" In the Black Book: Waking Dreams, encountered during the quest At the Summit of Apocrypha. "Shine Hammer Rage" Buried near Lake Yorgrim. Death dating back to Dragon War era. "Dark Maw Eat" Buried in a mound northeast of Sunderstone Gorge and southwest of Sleeping Tree Camp. Death dating back to Dragon War or just after. "Dark Overlord Fire" A dragon encountered underground, in Blackreach. VoslaarumDG VOSL1RUM One of two dragons encountered in a frozen lake in the Forgotten Vale. They are fought simultaneously and can dive under the frozen lake to ambush you. A mighty dragon lies dead. The standard loot for dragons is listed below; revered and legendary dragons give additional loot. With the Dragonborn add-on, you have the ability to ride specific dragons after obtaining all three words of the Bend Will dragon shout. After shouting at the desired dragon, it will land and you will be able to get on its back, and it will engage in flight. You give the dragon instructions, rather than directly controlling the dragon. There are a few dragons that you are unable to ride. Since Legendary Dragons only start to appear in regular leveled lists at level 78, this achievement is difficult to complete until your character reaches very high levels. Outside of the main quest, the most reliable way to find dragons to fight is to perform the radiant quests Dragon Seekers or Dragon Hunting. They are repeatable, and your destination is guaranteed to spawn a dragon. Dragon Seekers is available if you have completed the Companions questline and Dragon Rising, and Dragon Hunting is available if you have completed Rebuilding the Blades and are on friendly terms with the Blades. 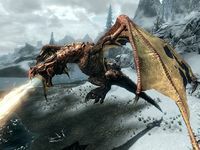 Although Arngeir says that dragons have the same ability as the Dovahkiin to absorb a slain dragon's soul, receive its knowledge, and use this to master a new shout, it never happens during gameplay. This is presumably because there is no occasion when one dragon fights or kills another, unless the player has summoned or mastered one: and on such an occasion, the Dragonborn is present to get the dragon soul, whether you want or need it or not. If you instantly kill a dragon while it rests on a word wall, or is completing an animation such as taking flight, the dragon will finish its animation (it will take flight if it is resting), before landing (or crashing) to die. This is due to the longer animation sequences associated with dragons due to their size. The Wabbajack will not transform a dragon, but can be used as a constant source of destructive blasts. 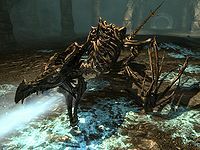 If Dragonborn is installed, the quest The Temple of Miraak has been completed, and the quest At the Summit of Apocrypha has not been completed, Miraak may appear and absorb the dragon soul before you can. Dragons are immune to all Illusion spells and effects cast at them. They also have extremely high Sneak ability, which allows them to signficantly counter all forms of stealth, including invisibility and muffle, though they're not technically immune to these effects. You will occasionally fail to absorb a dragon's soul after killing one. This issue can possibly result from fast traveling, mounting a horse, looting a container, or engaging an NPC in dialogue the moment the dragon dies. This bug usually occurs with dragons that have spawned from dragon lairs after you first visit them. Dragons will occasionally lunge through cover such as boulders, sarcophagi, and trees. If you have the Disintegrate perk and you disintegrate a dragon with a Shock spell, the ashes may disappear into the world terrain (or just be very hard to find). You will still absorb the dragon soul, but will miss out on the dragon bones and scales as well as the other leveled loot. If there are no open spaces nearby, wounded dragons (or those under the effects of Dragonrend) will sometimes be forced to crash-land and skid through solid objects, and often teleport wildly and/or end up at odd angles. Casting most spells on a dead dragon's skeleton may move it incredible distances. 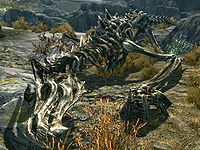 Right after a dragon dies, you can walk inside its corpse and view its skeleton before it disintegrates. You may see some dragons flying backwards. These dragons are not affected by Dragonrend and never land, so they can only be killed by arrows and spells. This bug was introduced with patch 1.2. This bug is fixed by version 1.3 of the Official Skyrim Patch. Sometimes after leaving a building or fast traveling, dragon skeletons will spawn and fall from the sky, without you fighting them at all. In some cases this is not a bug, but a result of the way the game saves data. When returning to an area where a dragon has been killed, after the cell has been unloaded from the buffer but before the corpse would have expired, the corpse is respawned in the air (as if a live dragon) and allowed to fall again. Dragons may spawn with their distant skin model instead of their close-up model, and will appear blocky with blurred skin. Saving and reloading will correct this. 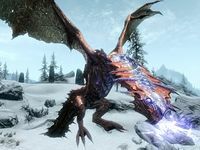 On the PC, some have experienced a glitch when performing one-handed weapon "finishing moves" on dragons in which the animation will be off-center. In most cases, it will appear as though the character is dangling off the right side of the dragon's head when the finisher animation occurs. Occasionally dragons can become invisible for no apparent reason, however NPCs will still attack them. When you visit a dragon lair, the dragon may be in front of the word wall stuck in the ground. This renders the dragon unkillable and it will not attack you. Using Storm Call to kill a dragon that's still flying may make it continuously fly in circles and become unkillable. If you fast travel after killing a flying dragon, the dragon may appear in that area. Dragons landing on stairs can get stuck since each step is its own surface and they cannot fit on a single step. This causes them to be stuck until the forced landing sequence, and in this case they simply jump up and crash back down. On rare occasions, a dragon soul will be absorbed before the dragon is dead, leaving an invulnerable skeletal dragon. Sometimes, a dragon may get stuck in a circle flight and will be unable to land or hover. They also become immune to Dragonrend, you can see the shout effect hitting them, but they won't land. They can only be killed by arrows or spells, and in some cases they will continue to fly in circles after their health is reduced to 0. Entering a building and going back outside fixes this. ? For more information on the dragons of the Elder Scrolls universe, see the lore article. This page was last modified on 26 February 2019, at 00:22.